Russia’s KH-101/102 cruise missiles are descendants of the Soviet era KH-55 missile. The KH-101 is the NATO designation for the missile carrying conventional warheads. It was first tested in 1995. When the cruise missile is affixed with a nuclear warhead, it is given the designation KH-102. The 1987 Intermediate-Range Nuclear Forces treaty (INF) prompted Russia to focus on tactical short-range missiles outfitted with conventional warheads. The KH-101 is a stealthy long-range cruise missile, with advanced guidance systems capable of hitting targets with incredible accuracy. It is an air-to-surface missile primarily launched from a strategic bomber, but can also be affixed to the Su-34 fighter jet. The missile’s GLONASS navigation system works in tandem with a TV terminal guidance system, which records visual data of the ground mid-flight. This allows operators to change targets post-launch. The computer matches geographical data with pre-loaded images of the target to confirm its impact point. Russia first used the KH-101 in combat on November 17th, 2015 against Syrian rebel groups outside of Damascus. 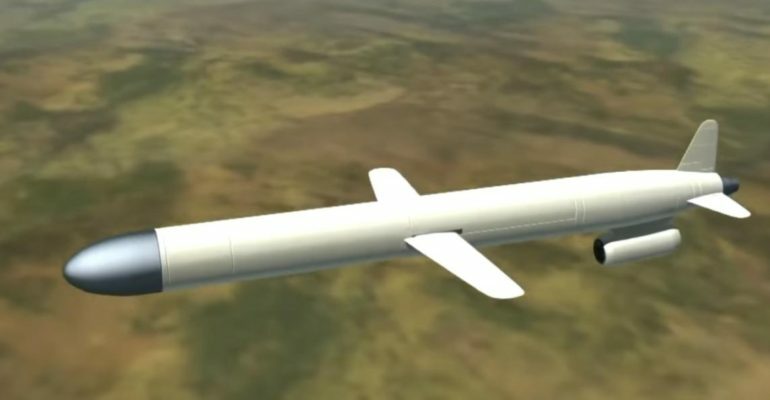 The KH-101/102 cruise missile utilizes radar absorbing materials and a low flight path to avoid radar and infrared sensors. It’s multi-faceted guidance system allows for it to weave between obstacles and air defenses on the path to its target, traveling at tree top levels until impact. This makes the missile very hard to detect, as it can evade defense systems in real time. Russia has found great success in using this weapon since 2015, and continues to employ it in combat operations. On November 17th, 2015, Russian Tu-95MS “Bear” strategic bombers departed from Engels airbase (in Russian territory) to strike ISIS command posts, weapons depots, and ammunition dumps located outside the Syrian cities of Homs, Raqqa and Aleppo. The bombers launched the KH-101 missiles from over the Mediterranean Sea, and the Russians used UAVs to monitor the effects on the targets. The bombers took a very indirect route, flying over 11,000km in total, and refueling in mid-air twice. Russian officials reported that the Khmemim airbase located in Syria was not used because its runway was too short to accommodate strategic bombers. The range and accuracy of the KH-101 was crucial to success in this mission, allowing Russia to initiate strikes from the homeland, without ever entering enemy territory. This is advantageous for them as the Tu-95MS is an outdated turboprop design with limited maneuverability. The KH-101 allows the Tu-95MS to remain useful to the Russians because it does not need to penetrate enemy airspace. This is important because the Russians reportedly maintain a force of around 60 of this model aircraft, but only 11 of the newer and faster Tu-160 supersonic bomber. The closest U.S. equivalent to the KH-101 is the AGM-129 Advanced Cruise Missile, which boasted a similar stealth profile and long-range capability, but has been retired. The U.S. is currently developing a Long-Range Stand Off missile (LRSO) intended to match Russian cruise missile capability. LRSO missiles are less of a threat to global stability because they cannot execute short-notice, disarming attacks like ground-based ballistic missiles. Bombers are slow aircraft that take hours to reach their release points and can be recalled at any time before launch. By banning ground-based intermediate-range cruise and ballistic missiles, the INF treaty has fostered competition between the U.S. and Russia in developing these air-launched LRSO missiles. The U.S. developing an effective LRSO counterpart to the KH-101 will determine how effective it can remain in A2AD environment and its ability to project force globally.